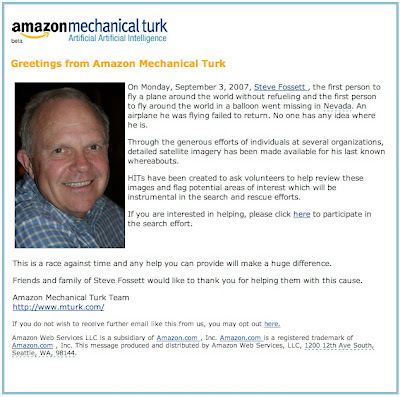 Amazon is using their Mechanical Turk service to assist in the search and rescue for missing aviator Steve Fossett. I hadn't heard of it before, but TechCrunch has a story on how Amazon did something similar when Jim Gray was lost at sea. Very interesting and noble use of crowd sourcing. "It has emerged that more than 150 small aircraft have disappeared in Nevada in the past 50 years, never to be found. "We’re finding them left and right. Nevada is a graveyard," said Kim Toulouse, a spokesman for the Nevada Department of Wildlife, which has been helping the search." "As added spice to the tale, the admission by Ryan that military sats had already been deployed to cast an eye over Nevada will add fuel to the conspiracy theory that the Fossett search is actually a cover story, and the authorities are rather urgently looking for a 150 kiloton nuclear weapon which inconveniently detatched itself during the recent unscheduled TransAmerican B-52 nuke jaunt."